Download BonziBUDDY Now - FREE! Welcome to the world of BonziBUDDY! He will explore the Internet with you as your very own friend and sidekick! He can talk, walk, joke, browse, search, e-mail, and download like no other friend you've ever had! He even has the ability to compare prices on the products you love and help you save money! Best of all, he's FREE! Keeps you informed of late breaking news! He organizes the Internet the way you want it! He will make you smile throughout your day with his little gorilla personality! He can educate people of all ages with his wealth of knowledge and trivia! He makes your computer and the Internet easier, safer, and definitely more fun! He has the ability to save you money! He will search the Internet for the best price on the products you love! a 'Best Friend' Now -- FREE! For a limited time, you may download your own BonziBUDDY -- FREE! BonziBUDDY we'd like to say "Thanks!" just for visiting US! System Requirements: 16MB of RAM, 11MB of Free Disk Space. Windows 9x, NT 4, ME, Win2000 Sound Card. Microsoft IE (Internet Explorer) 5.0 or above. Windows, Microsoft Internet Explorer, and Microsoft are registered trademarks of Microsoft Corporation. 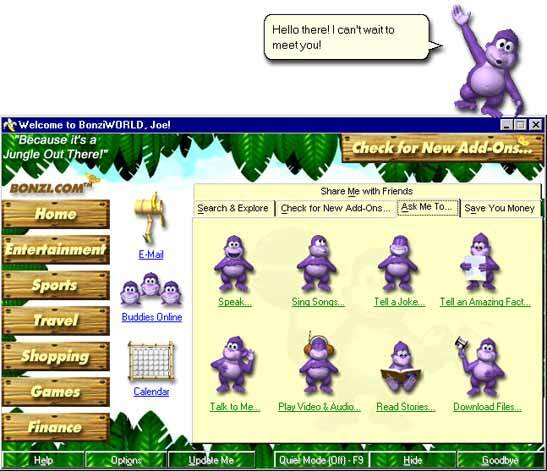 BonziBUDDY and BONZI are trademarks of BONZI.COM Software. All rights and liabilities with respect to BonziBUDDY belong solely to BONZI.COM Software. BonziBUDDY uses Microsoft Agent Technology. Copyright © 1995 - 2000 - All Rights Reserved. Take a minute... and make a friend for life!